The numerical techniques used to solve the Primitive Equations in this model are based on the traditional, centred second-order finite difference approximation. Special attention has been given to the homogeneity of the solution in the three space directions. The arrangement of variables is the same in all directions. It consists of cells centred on scalar points ( , , , ) with vector points defined in the centre of each face of the cells (Fig. 4.1). This is the generalisation to three dimensions of the well-known “C” grid in Arakawa's classification [Mesinger and Arakawa, 1976]. The relative and planetary vorticity, and , are defined in the centre of each vertical edge and the barotropic stream function is defined at horizontal points overlying the and -points. The ocean mesh ( the position of all the scalar and vector points) is defined by the transformation that gives ( , , ) as a function of . The grid-points are located at integer or integer and a half value of as indicated on Table 4.1. In all the following, subscripts , , , , , or indicate the position of the grid-point where the scale factors are defined. Each scale factor is defined as the local analytical value provided by (2.6). As a result, the mesh on which partial derivatives , and are evaluated is a uniform mesh with a grid size of unity. Discrete partial derivatives are formulated by the traditional, centred second order finite difference approximation while the scale factors are chosen equal to their local analytical value. An important point here is that the partial derivative of the scale factors must be evaluated by centred finite difference approximation, not from their analytical expression. This preserves the symmetry of the discrete set of equations and therefore satisfies many of the continuous properties (see Appendix C). A similar, related remark can be made about the domain size: when needed, an area, volume, or the total ocean depth must be evaluated as the sum of the relevant scale factors (see (4.8)) in the next section). 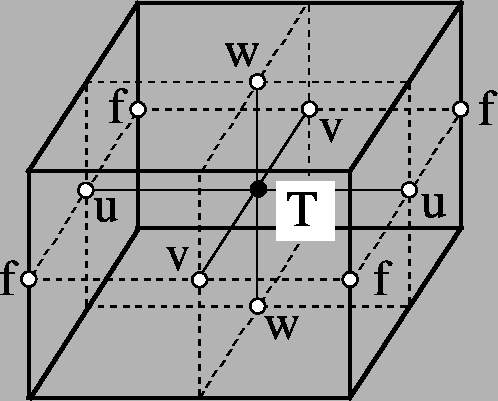 where is the ocean depth, which is the masked sum of the vertical scale factors at points, and are the bottom and surface -indices, and the symbol refers to a summation over all grid points of the same type in the direction indicated by the subscript (here ). It is straightforward to demonstrate that these properties are verified locally in discrete form as soon as the scalar is taken at -points and the vector A has its components defined at vector points . In other words, the adjoint of the differencing and averaging operators are and , respectively. These two properties will be used extensively in the Appendix C to demonstrate integral conservative properties of the discrete formulation chosen. The array representation used in the FORTRAN code requires an integer indexing while the analytical definition of the mesh (see §4.1.1) is associated with the use of integer values for -points and both integer and integer and a half values for all the other points. Therefore a specific integer indexing must be defined for points other than -points ( velocity and vorticity grid-points). Furthermore, the direction of the vertical indexing has been changed so that the surface level is at . 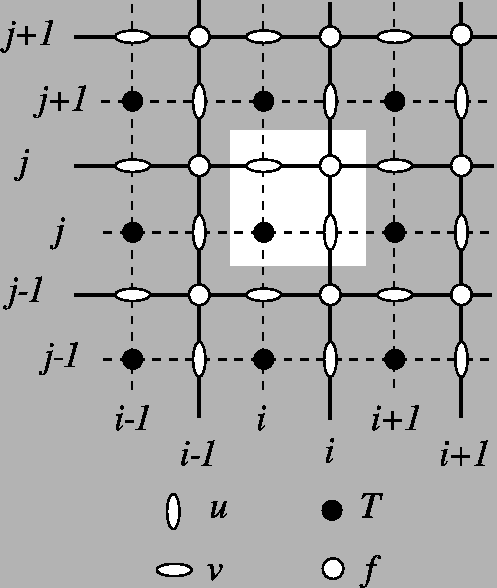 The indexing in the horizontal plane has been chosen as shown in Fig.4.2. For an increasing index ( index), the -point and the eastward -point (northward -point) have the same index (see the dashed area in Fig.4.2). A -point and its nearest northeast -point have the same -and -indices. In the vertical, the chosen indexing requires special attention since the -axis is re-orientated downward in the FORTRAN code compared to the indexing used in the semi-discrete equations and given in §4.1.1. The sea surface corresponds to the -level which is the same index as -level just below (Fig.4.3). The last -level ( ) either corresponds to the ocean floor or is inside the bathymetry while the last -level is always inside the bathymetry (Fig.4.3). Note that for an increasing index, a -point and the -point just below have the same index, in opposition to what is done in the horizontal plane where it is the -point and the nearest velocity points in the direction of the horizontal axis that have the same or index (compare the dashed area in Fig.4.2 and 4.3). Since the scale factors are chosen to be strictly positive, a minus sign appears in the FORTRAN code before all the vertical derivatives of the discrete equations given in this documentation. Figure 4.3: Vertical integer indexing used in the FORTRAN code. Note that the -axis is orientated downward. The dashed area indicates the cell in which variables contained in arrays have the same -index. 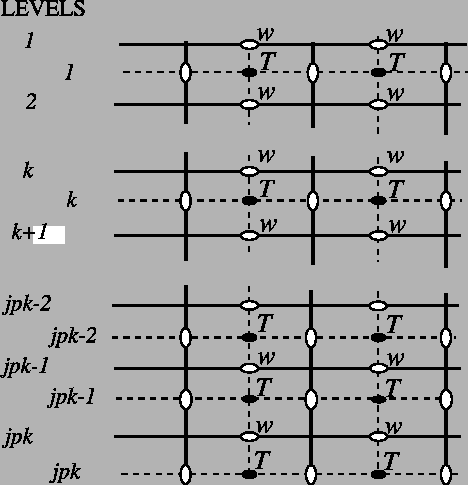 The total size of the computational domain is set by the parameters jpiglo, jpjglo and jpkdta in the , and directions respectively. They are given as namelist variables in the namcfg namelist. Note that are other namelist variables in the namcfg namelist that refer to the domain size. The two variables jpidta and jpjdta may be larger than jpiglo, jpjglo when the user wants to use only a sub-region of a given configuration. This is the "zoom" capability described in §15.3. In most applications of the model, , , and . Parameters and refer to the size of each processor subdomain when the code is run in parallel using domain decomposition (key_ mpp_mpi defined, see §8.3).